Strange that the protesters who massed in Venice to delay three cruise ships from leaving the Stazione Marittimo chose Sunday for their action; a day earlier and they could have inconvenienced ex-prime minister Silvio Berlusconi, who is spending a week on board MSC Divina. As it was, the sister ships MSC Opera and MSC Musica, together with Costa Favolosa, were held up by about 70 small boats marshalled by the No Grande Navi organisation which wants large cruise ships to be banned from the lagoon on environmental grounds. 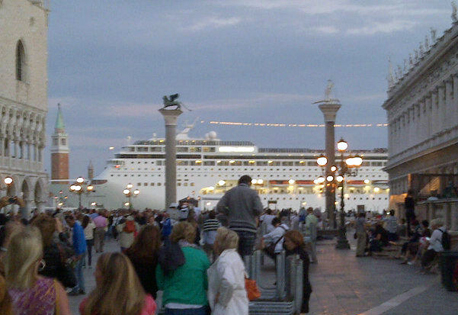 The protesters claim that the wash generated by the ships as the pass through the Guidecca Canal and within yards of the Doge’s Palace and Piazza San Marco undermines the city’s foundations. They want a new channel to be dredged for cruise ships arriving in Venice, or the construction of a new terminal on a completely different site. While both may seem admirable ideas, financial limitations make them unlikely. Work on a tidal barrier at the entrance to the lagoon has been delayed countless times, and Italy’s current financial crisis is pushing completion back even further. Venice’s Marco Polo airport has been waiting more than 10 years for Government funding to pay for expansion, so what hope is there of money being made available for passenger access by water? The port authority argues that the environmental impact of cruise ships is minimal, and local environmental groups claim that a new channel could result in catastrophic changes to water flow through the lagoon. The two million-plus passengers who arrive in Venice by ship each year may face further disruption if protests grow, but there’s more chance they’ll be mown down on the Rialto bridge by a runaway Rolls-Royce than of being banished completely.